I bought two items to use in my pizza dough. There is a really great website that explains all of the variables that go into and how to solve problems with pizza dough. 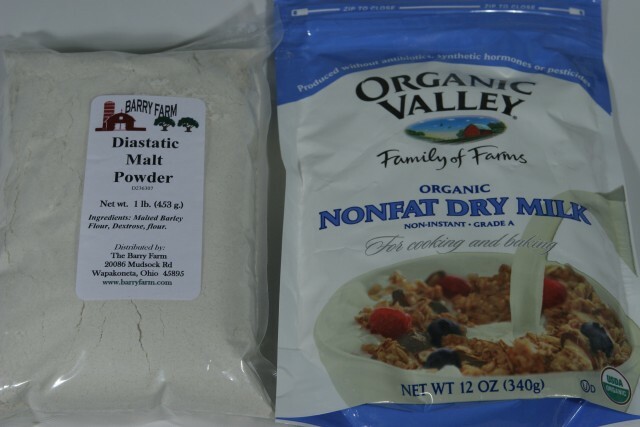 The first is diastatic malt powder. This includes an enzyme called alpha-amylase which breaks down the long starch molecules and tenderizes the dough. The second is NFDM or non-fat dry milk powder. This should help with fermentation tolerance and crust browning. I used the diastatic malt power in the pizza dough recipe first. And I did notice a slightly looser dough and softer crust. But I want to go a little further. The package suggested one quarter of a teaspoon per loaf. My recipe creates 3 pizza pies, so I used one teaspoon. Next time, I will bump it up by 50% to a teaspoon and a half. This entry was posted in Baking on April 29, 2007 by Mark. I baked some more bread today. Update: I forgot to add that I made sweet potato french fries on Saturday. Very good! This entry was posted in Baking on February 6, 2005 by Mark. I tried a free form attempt at making sourdoug bread. I used some new techniques. This entry was posted in Baking on January 23, 2005 by Mark.